The new 2011 Dodge Durango is well suited to those who need to carry more than five passengers and tow more than 7,000 pounds, all while riding in car-like comfort. Styling inspired by the Dodge Charger adds a sporty dimension not shared by other vehicles in this class. I love the size of the Durango! I do wish it was a little bit bigger though. I like the fact that you can fold the second and third row seats down for carrying large items and you can fit 3 car seats comfortably in the second row and third row(so 4 car seats all together) but in order to get to the third row you would have to undo one of the car seats in the second row to move the seat and get back to the third row. We get pretty good gas mileage from our Durango too. A full tank will last me about a week if not a little longer. We did have some problems with the tip shortly after purchasing the Durango which also led to a dead battery(which wasn't covered in our warranty), but it was a problem that a lot of the Durango’s had and became a recall. Other than that, I do love the Durango. 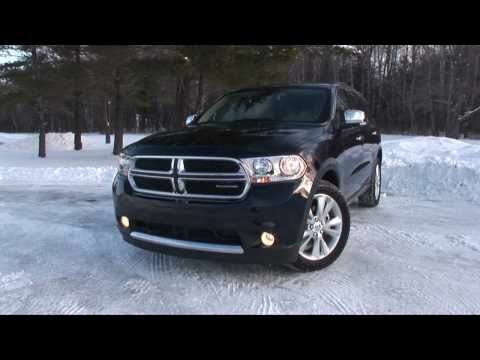 2011 Dodge Durango crew cab- just my opinion. There have been quite a few recalls on this vehicle. We had our alternator start giving us trouble, but it wasn't part of the recall. It quick and left me stranded, in a vehicle that is completely electric, so I couldn't do anything, not even lock the doors. We paid to have the alternator fixed, and then a few months later it was put on the recall list, so we were reimbursed the cost. The whole ordeal was slightly more than inconvenient. It is comfortable to drive, and I enjoy that the front seats completely recline. It is nice on long car trips, where the driver needs to pull over and sleep. I wish it had a better stereo system, but from what I can tell, the newer vehicles do. The Durango seats 7 very comfortably. The third row seats fold completely down for more room in the back and 2 car seats fit great in the back seat. We have 2 kids under age 5 so we have 2 car seats that have to fit in the back seat and the Durango can fit them comfortably. There is plenty of room in it. We did have an issue with the TIPM within the first year of driving the car and that caused problems with our fuel pump which led to our battery dying but I believe that was an issue that became a recall. I do sometimes accidentally hit the shifter in the middle of the counsel which causes the car to go from auto to manual and then have to pull over to get it back to auto. That is a feature I could go without. Otherwise, the Durango is a great, very roomy and comfortable vehicle. Chrysler Group LLC (Chrysler) is recalling certain model year 2011 Dodge Durango and Jeep Grand Cherokee vehicles manufactured January 5, 2010, to July 20, 2011, and equipped with either a 3.6L or 5.7L engine. In the affected vehicles, the fuel pump relay inside the Totally Integrated Power Module (TIPM-7) may fail, causing the vehicle to stall without warning. Chrysler will notify owners, and dealers will replace the fuel pump relay with one external to the TIPM, free of charge. The recall is expected to begin on October 24, 2014. Owners may contact Chrysler customer service at 1-800-853-1403. Chrysler's number for this recall is P54.